Systemic human rights abuses pervade the global garment industry, from poverty pay, long working hours and denial of trade union rights to significant risks to workers’ health and safety through unsafe buildings, heat, lack of ventilation, no access to clean drinking water and restricted access to the bathroom, and use of dangerous chemicals. Violence and abuse are commonplace, and workers are often attacked or even killed for joining a union and demanding better working conditions. Long hours, often 10-14 hours a day plus forced overtime, of repetitive work often leads to injuries which go undiagnosed. Workers who cannot keep up with production due to pain or discomfort are fired. 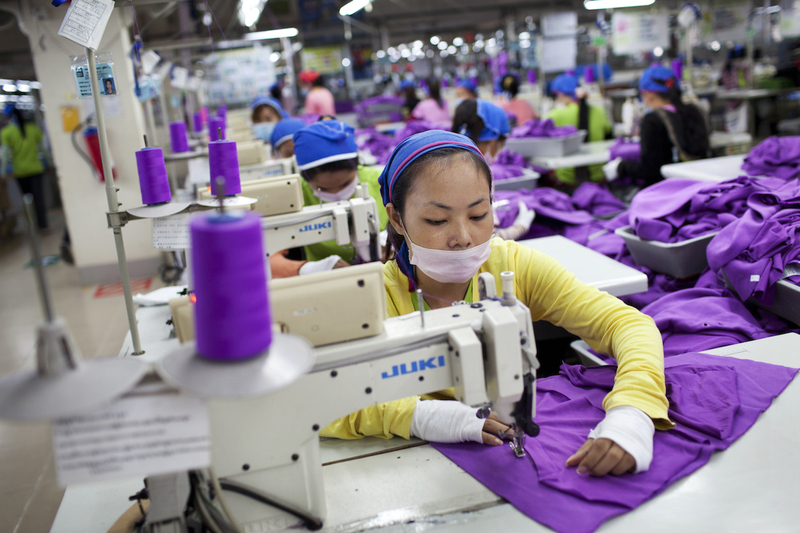 When pressure is on to fulfil large orders workers can be forced to work 18 hours a day. If workers refuse overtime there have been reports of them being fined or even fired. Many factories have no emergency exits or they lock the doors and bar the windows to deter theft, causing many people to die when a factory fire occurs. For example, the Ali Enterprises fire in Pakistan, 2012, where 254 people died and over 55 more were seriously injured as workers remained trapped in a burning building. Factories are being set up cheaply in buildings not designed to house heavy machinery, leading to building collapses and worker deaths. The garment industry operates under a veil of secrecy with an almost total lack of transparency enabling ongoing exploitation of workers. In Bangladesh, a worker interviewed in 2003 was ill at work for two months before she missed a day to go to the doctor. Her manager then deducted two days pay,and she lost her full attendance bonus. On return she was told to work an extra eight hours unpaid to catch up with her target. In total, being unwell cost her 11 days' wages. "We work from 8 am till noon, then have our lunch break. After lunch we work from 1 to 5 pm. We do overtime every day, from 5.30 pm. During the peak season, we work until 2 or 3 am. Although exhausted, we have no choice. We cannot refuse overtime: our basic wage is too low. If we want to rest, our employer forces us to keep working".